(CNS) The Holy Year of Mercy was an opportunity to encourage Christians to meet people’s “real needs” with concrete assistance said Archbishop Rino Fisichella, president of the Pontifical Council for Promoting New Evangelization, the office that organized events for the Holy Year of Mercy. The yearlong extraordinary jubilee included several individual jubilee days, such as for the Roman Curia, catechists, teenagers and prisoners. The special Holy Year was celebrated from Dec. 8, 2015, until Nov. 20, 2016. Special celebration of a jubilee year has been part of our Catholic history since the time of Pope Boniface in the year 1300. He invoked the jubilee year then because of the terrible afflictions that people were suffering. It was a time of prayer, of supplication. A special time of pilgrimage to seek forgiveness of sins against God and against one another. It was a time of “calling people home” to the faith. Since 1300 till 1983 there were 120 Holy Years celebrated of which 30 strictly would be called jubilee years. 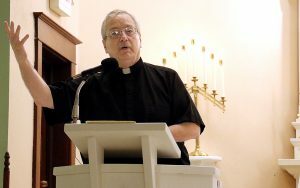 Father Peter Etzel, SJ, presents “Examen Prayer” during the Deanery One Day of Mercy. Click to see the presentation. 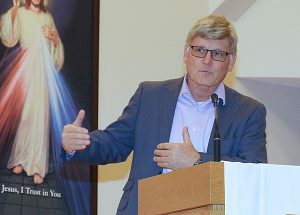 Click to watch Dr. Bryan Thatcher, present “The Life of St. Faustina” during the November 19 pilgrimage to St. Francis of Assisi Church, Sturgis.